Everyone loves having the inevitable pumpkin and apple pie for dessert after Thanksgiving dinner. You can still have that, but why not make something that the kids can help you with? You can make festive cookie corn husks out of ingredients you probably already have in your pantry. This is a super fun activity that will help you create new happy memories with your family and friends this Thanksgiving. Prepare your sugar cookie mix. Some mixes will call for eggs, butter, oil and water. Just keep it simple and get one that you already have ingredients for. Prepare the dough, but do not bake! Use your professional cookie press, to make different shapes for the kids to decorate. Use the cookie press or your hands to make long corn-husk shapes for the base of these festive cookies. Follow the directions on the cookie package and bake the cookies accordingly. While the cookies are baking you can prepare you own frosting if you’d like. To make your own frosting use a beater to mix 2 cups powdered sugar, 2 tablespoons of butter, 2 tablespoons of milk and a half tablespoon of vanilla. After the cookies have baked and cooled for about 20 minutes, then you or the kiddos can spread a layer of your vanilla frosting on the top of your corn husk cookies. Then use skittles or M&M’s to make rows up and down the cookie. 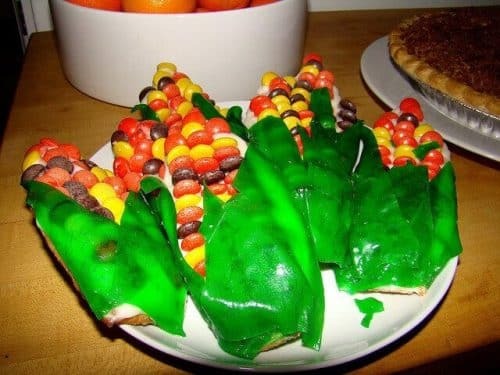 Remember it’s supposed to look like corn, but it should also be fun. So don’t worry too much. Lastly, take you fruit-roll ups, preferably green and tear them into triangles or cut them with kitchen scissors to make triangles. Then angle them at the top of your corn husks to complete your cookies. so that you can enjoy them over the next few days. Happy Thanksgiving!